While I am no Mrs. Duggar, with this being my fourth go-round at this pregnancy thing, some might call me an "expert" on the subject. Through each experience there are some staples that have made their appearance every time so I thought I would share. This is an every day must. You should actually start taking prenatal vitamins well before you become pregnant. There are a million different kinds to choose from, including a gummy kind from VitaFusion that had always been my favorite. BUT - did you know that gummy vitamins do not contain iron? I learned that when I became anemic while pregnant. I couldn't understand how that would happen because I was taking my vitamins every day. Then I remembered that prior to one of Aiden's surgeries, the doctor told me to start giving him Flintstones chewable vitamins instead of his normal gummy kind...because they didn't have iron. Sure enough I checked the bottle on my prenatals and it lacked that important nutrient. At that point I needed to switch to a prescription prenatal vitamin called CitraNatal that has added iron, which is what I currently take and have no complaints. Everyone knows that your water intake should drastically increase during pregnancy. Some might find it difficult, especially if you typically get your liquid fill from coffee, tea and/or soda. I have found that if you keep a large, ice cold water jug nearby, you will constantly sip on it and before you know it will need a refill. I have this Bubba Keg version which I love because it is insulated and fits in the cup holder of my car. I take it with me everywhere! I bought all kinds of "long" tank tops when I first got pregnant with Ethan. Almost seven years later, these maternity tanks from Liz Lange still fill my drawer. They are just the right amount of soft and stretchy and the length is perfect for covering a bump big or small. They are thick enough that you can wear them under an open shrug or sweatshirt without being see-through. I love them so much I wear them all the time even when I'm not pregnant. They're great for layering! Luckily, they must be one of the lines best sellers because they still carry them at Target to this day. I've nabbed one in almost every color they make - and there are even some really cute stripe ones too. Let's face it, if you go through pregnancy without needing to barf at one point or another you are indeed a lucky one. For me, riding in airplanes and cars was the worst. I flew at the beginning of this pregnancy and spent the entire flight with my face stuck inside their little barf bags. They were so convenient that I decided to ask the flight attendant for a few extra just in case and I stuck them in the inside pocket of my car door. They are the perfect size for on the go! If you can't snag some from someone who is traveling by air, then just be sure to be prepared with something. Throwing up in your kids empty Chik-fil-a sack isn't fun, but it's better than nothing! I've always loved wearing my shirts a little longer so that they sit just at my hips. For me, I feel like it goes best with my body proportions. So because I already had some of these long tunic-style tops in my closet, I was able to continue to wear them while pregnant, making the transition into maternity wear much easier (and cheaper!) And pairing these long tops with comfy leggings is my go-to style choice...see below for my favorite pair. Now it will depend on if you have an "over the belly" or "low rise" maternity pants preference, but for me I'm an "over the belly" girl all the way. I generally think they are more comfortable that way and the extra material helps to smooth things out - especially if you have a belly button that sticks out when pregnant like I do :) These leggings come in capri-length for spring/summer mamas and the long ones are great for wearing with tall boots in fall/winter. I've got a pair in just about every color they make - light gray, dark gray, black, and navy. And I should mention I've tried several different maternity legging brands but always choose these in the end. When I first got pregnant with Ethan my sister gave me her Snoogle pregnancy pillow to borrow. I thought it was a little strange looking and wasn't sure I'd ever use it. It took up a lot of space in our king size bed, often making the sleeping arrangements a bit awkward so I'd dump it on the floor halfway through the night. But then, suddenly, I couldn't sleep without it. Having the "C" shaped pillow to curl my body around was so comfortable. When I got pregnant for the 2nd time, my sister was as well so I had to give it back to her and splurge on my own. At around $60 a pop, it wasn't cheap. But still, so worth it. If you don't want to spend that kind of money, just head to Wal-Mart and buy a long body pillow for around $10. It isn't quite the same but if positioned just right can be quite comfy too. Finally, I highly recommend stocking up on your favorite lip gloss / chapstick. Remember how I mentioned the breathing difficulties in number 3? Well even with the Breathe Right strips you are gonna want to keep your lips slathered in lip balm. Especially if you are pregnant in the winter time when your skin generally tends to dry out anyway. The soothing tingle of Carmex makes it my top pick. So there you have it. 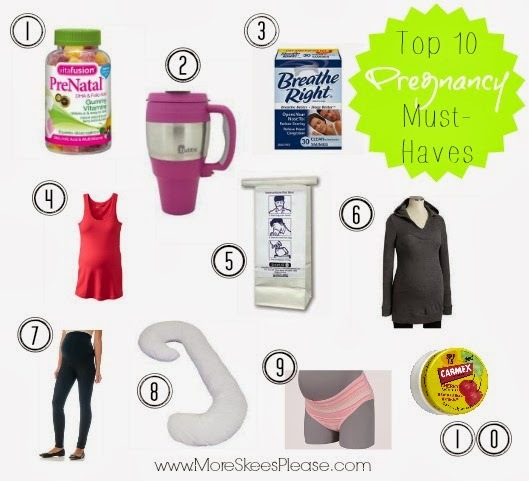 The top 10 things I couldn't live without while pregnant. Do you have a must-have that you want to share? Leave a comment below! * No portion of this post was sponsored by any of the products/brands listed. I am simply sharing my go-to pregnancy picks! 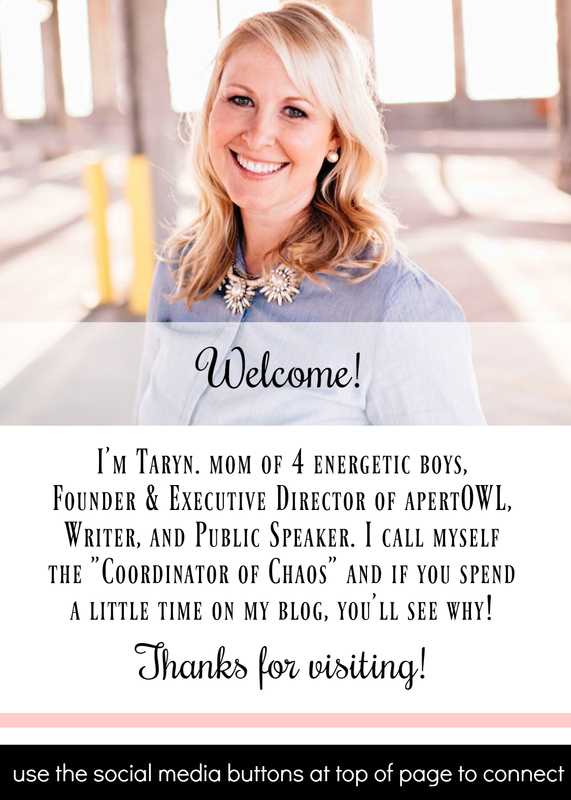 However there are affiliate links included in this post.